As per W.H.O.about 21000 plants have got medicinal values.Among them about 300 plants are in India.Nearly 70% of the rural people of India depend upon these medicinal plants to get relief from their ailments. India especially the Himalayas have got an unparalleled collection of these medicinal plants. Brahmi is one among them. The word Brahmi means the Goddess of intelligence. It has been extensively used in Ayurveda for the last thousands of years. Brahmi has been mentioned in the historic medicinal book ” Sushrut samhita “. Chinese people use this in their traditional medicines for youthfulness and longevity of life. In Sanskrit it is called Kapotavanga, Somavalli, Saraswati, Suvarchala, Mahoushadhi,Surashreshta, Vaidhatree, Divyateja, Varaa, Parameshtinee and Soumyaa. It is called Ondelaga(Kannada-the one with single leaf), Timare(Tulu), Vallarai(Tamil), Mandook ,Brahmichattu(Telugu), Muttal(Malayalam), Brahmi(Hindi), Sooryaphalavalli(Marathi), Ekpanni(Konkani). The scientific name of it is Centella asiatica. Read more about it at wiki. It is a small plant with a stem and single leaf resembling the ear of mouse. It spreads very fast in low wet areas. In rainy season,it grows well. It is commonly seen in the hilly areas by the side of the road from Haridwar to Badri. Brahmi that we get here is the best one amongst all. * It helps in the growth of nerve cells. It helps to reduce mental tension. It removes depression. It improves the remembering power of the brain. * It helps in the development of the cells of hair follicles. Hence it is used in the production of hair oils. We see it in the advertisement of Dabur – the famous ayurvedic company of India.It also helps to get rid from dandruf. * Eating 4 – 5 leaves of Brahmi helps in correcting the voice especially in children with speech deformity. *Take the juice of the leaves. Rub it to the base of the hair.Keep it for 30 minutes and then take bath. This removes dandruf. * It improves digestive capacity and removes acidity when taken orally. 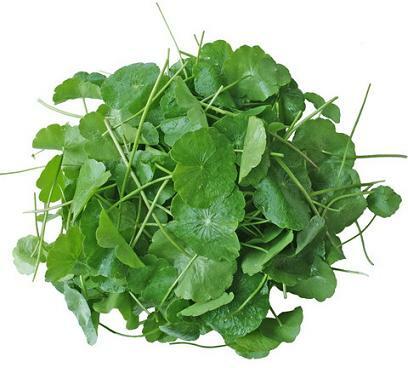 * Brahmi contains kerotin, amino acids and vitamins. Hence it acts as a nutritious food. * It is also used in epilepsy and skin diseases. I prepare the hair oil in this way – Take one cup of coconut oil and add one cup of brahmi leaves with stems and boil it till the leaves become crisp.Take it out from the heat and add a pinch of pachch-karpoor. If not available you may add camphor. Store in a container after filtering.It can be used regularly to get the best results. Check out the Tambli recipe. It goes well with chapatis or dosas or eaten with rice after dilution. PS: The medicinal values of the plant are mentioned for reference only. Do not take this as expert opinion.